We confirmed the lineup for the Thursday, Friday, and Saturday night of the Virginia Moose Association Convention Weekend. 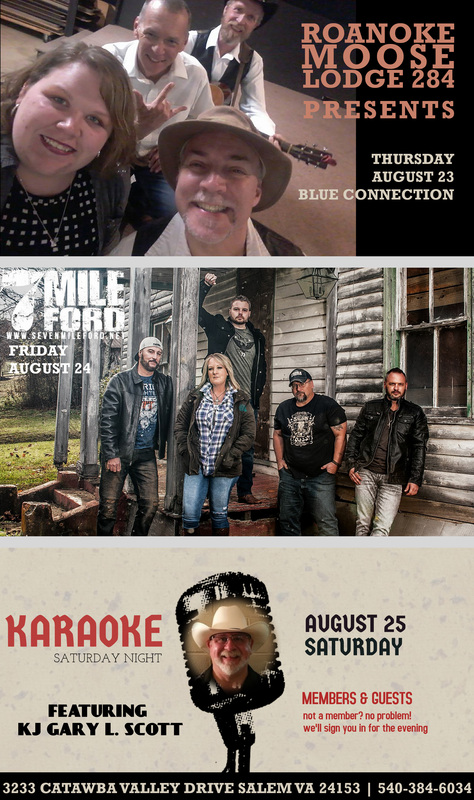 We’ve got Blue Connection on Thursday, 7 Mile Ford on Friday, and KJ Gary Scott on Saturday. The convention itself will take place at the Sheraton (LOOM) and Holiday Inn (WOTM) at Valley View. Visit this website to learn more. We will have a free shuttle taking convention goers back and forth to Roanoke Moose Lodge 284. Stay tuned for details. Click on this flyer to open a larger version. With Valentine’s Day being a Wednesday this year, the men and women of lodge 284 got creative with our Valentines event and decided to host a joint adult dinner / kids party event in the lodge on Friday, February 9th. Bring your children to the Kids Night Out party taking place in the Grand Event Hall while you enjoy a lovely adult-only Valentine’s Dinner in the social quarters. 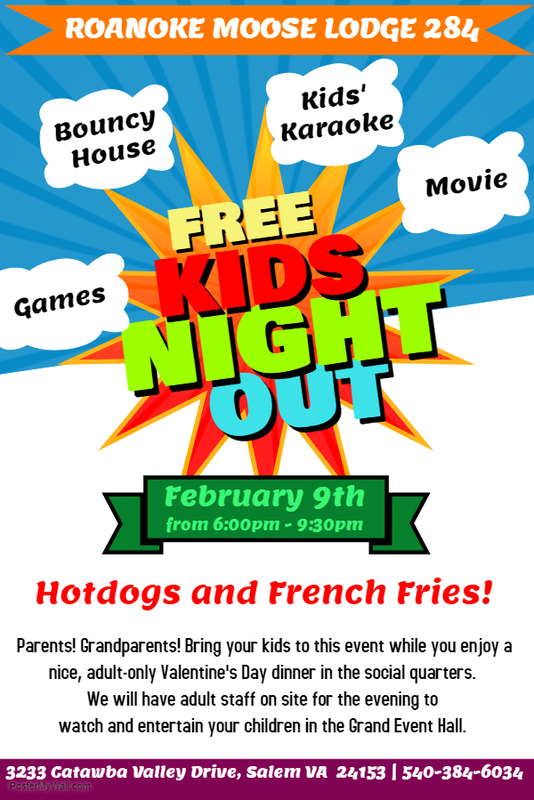 In conjunction with the adult-only Valentine’s Dinner, we are hosting a FREE Kids Night Out party on February 9th! We invite you to bring your kids to this event while you enjoy a quiet dinner in the social quarters*. We will have adult staff on site to watch and entertain your children in the Grand Event Hall! Tentative activities planned include Kids Karaoke, a Bouncy House, a Movie and a number of activities and games! 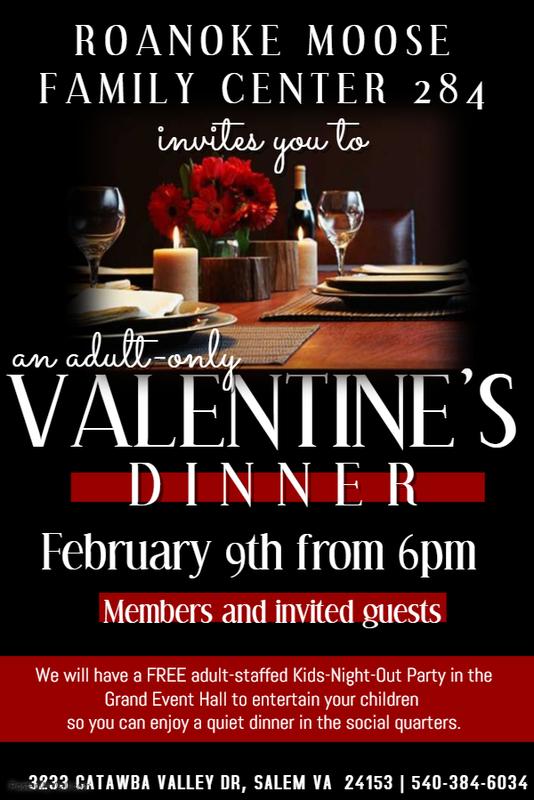 *This is not intended to be a kid-drop-off event; it is offered in conjunction with the Valentine’s Dinner in the social quarters. We were saddened to hear that our dear friend and moose brother Steve “Mountain Man” Blevins passed away on Thursday, January 18th, 2018. He was usually the first to greet new guests in the lodge and was always ready and willing to help with any event. We will miss our dear “mountain man”. The fundraiser was extremely successful – with $4,000 going to the family – and we thank everyone who donated baskets and gift cards and all the volunteers who helped with the fundraising aspect for the evening, especially Ruth and Heidi, who kept track of the raffle items as they were won and the auction items as they were sold. It’s events like this when you feel really proud to be a Moose. 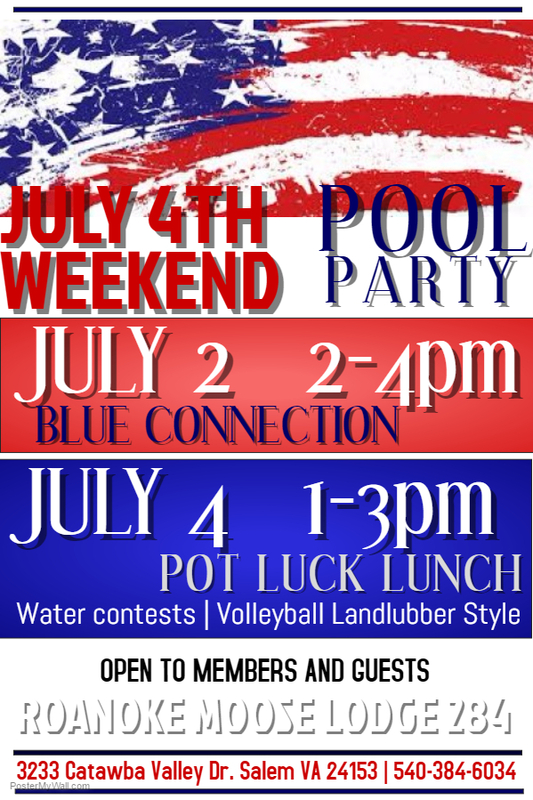 Come enjoy the pool this 4th of July weekend! The pool will be open from 11am to 7pm all four days, and hopefully the weather will cooperate. For your listening pleasure we will have Blue Connection playing in the Pool Pavilion from 2-4pm on Sunday! For your gastric delights, we invite you to bring your favorite dish to the 4th of July pot luck lunch cookout from 1pm-3pm. In addition we will also have volley ball, contests and prizes throughout the weekend! Open to all members and guests.